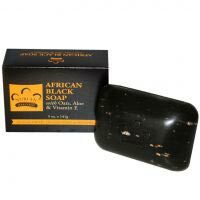 African Black Soap (Base), Coconut Oil, Palm Oil, Butyrospermum parkii (Shea Butter), Avena sativa (Oat) Kernel Meal, Aloe barbadensis Leaf Juice, Plantain Extract, Tocopherol (Vitamin E), Vegetable Glycerin, Mineral Pigment, Vegetable Color, Essential Oil Blend. Definitely, the best acne treatment, soap, cleanser, etc. there is out there. I've tried EVERYTHING and this is the only thing I use now. My face is clear! I've been dealing with acne for 25 years and believe me, I was getting tired of trying all sorts of treatments (chemicals, naturopathic, homeopathic, rx, over-the counter). This is the real deal! AMAZING! Cleared up my mild acne & smoothes out bumps too. The lather feels so luxe, it feels like heaven & smells amazing. But, he smaller the bar gets the less effective it becomes, but that doesnt bother me too much, just buy a new one. It is a bit drying when you first start using it but carry on & it will be ohkay. I use with the Neutrogena On The Spot recommended here on Acne.org and my Cetaphil Moisturizing Lotion. Lovely product! I will admit, I was very freaked out at first, but I have come to love this stuff!! It smells great and lathers super well. When I rinse my face after cleansing with it, my face is literally squeaky clean. I bought this stuff while I through a really bad breakout, like REALLY bad. I had those kind of zit that are huge but way under the surface and don't go away. Now here is the weird part: I had washed my face with this for the first time that night and when I woke up the next morning, MY GLAND WERE SO SWOLLEN. It was so weird, because I wasn't sick at all. Oh, and not to mention that my zits were 100% FLAT. It was almost like the soap had drained all the infection and was killing my zits from the inside out. There was no temptation to pop them and the redness was gone by the end of the day. Now after this, my skin continued to look great with tiny breakout here and there, and the gland thing never happened again, which is why I was skeptical that it was the soap that caused it. But then I recommended this soap to a friend and the same thing happened! Although this experience was quite strange, the product works amazingly and I would totally recommend it to anyone. Does it help with acne scars ?